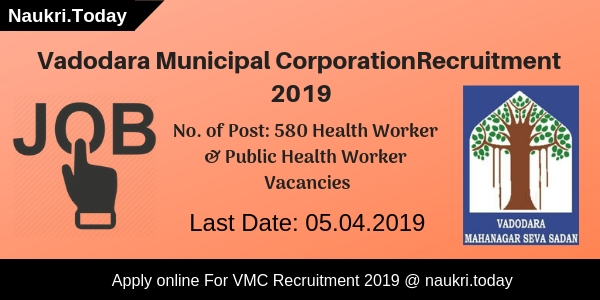 VMC Recruitment 2019 – Vadodara Municipal Corporation has published notification for 580 Health Worker & Public Health Worker Vacancies. Candidates may apply online for Health Worker & Public Health Worker Vacancies from 21 March 2019. The Registration Process will be closed on 05.04.2019 for VMC Vacancy 2019. The Department will exempt all category candidates from the payment of an application fee. Candidates should read below article for further more details. What Are The Documents Required To Apply For VMC Jobs 2019? Participants should require some important documents to fill up an application form for VMC Health Worker Vacancy 2019. These documents consist of details which you may need to fill up in an application form. Here we gave you a list of documents which may require to fill up application form for VMC Recruitment 2019. Aspirants should log on to the official website of Vadodara Municipal Corporation i.e. vmc.gov.in. Search for Recruitment option on the Homepage. Participants should open Advt. notification and read it carefully. Eligible candidates may apply online for Health Worker Posts. Are you seeking for VMC Recruitment 2018 ? If Yes, Here we are with a news for you. Vadodara Municipal Corporation has issued 258 Post of the Female Health Worker, Staff Nurse and various post. Registration for VMC Vacancy 2018 will be start from 28 March 2018. Candidates can apply from Links provided Here or from Official Website of Vadodara Municipal Corporation Jobs 2018. Applicants may also download VMC Female Health Worker Notification 2018 from this page. Participants must fill up their Application Form for VMC Recruitment 2018 before Last date 10 April 2018. Vadodara Municipal Corporation, Gujarat has provided an opportunity to female candidates to grab Government Job. Participants should check Post wise Division of vacancy which is given below. Aspirants may also check Eligibility Criteria, Selection Process and much more. For Furthermore details candidates must consult to Official Notification of VMC Vacancy 2018. Vacancy Name : Female Health Worker, Staff Nurse and Other Posts. Aspirants may check their Application Form once again after filling up Completely. If any mistake is found in candidate’s Form their Form Will be rejected. Participants must download Official Notification of VMC Jobs 2018 from Links given below. Candidates must check Qualification, Minimum Age and Pay Scale for Vadodara Municipal Corporation Vacancy 2018. Applicants who are going to apply for Vadodara Municipal Corporation Recruitment 2018 must have minimum 10+2 Degree and Candidates those who apply for Higher post, they should have Graduation in their Particular Field. For Furthermore details Applicants must check Official Notification of VMC Jobs 2018. Participants must start preparing for VMC Female Health Worker Vacancy 2018 before Examination. Vadodara Municipal Corporation, Gujarat had issued List for Maximum Age according to the Post. Participants must check List which is given below. Candidates should check official Notification for Age Relaxation provided by VMC Vacancy 2018. Minimum Age is 18 Years for applying Candidates for VMC Female Health Worker Jobs 2018. Vadodara Municipal Corporation is one of the finest Department of Gujarat. VMC Bharti 2018 is set Salary Package for Different Posts. Applicant’s Salary Package for Female Health Worker is Rs. 19900 /- to Rs.53200/-. Applicants can check VMC Notification 2018 from Official Website or from this Page for Pay Band of Other Post. Candidates should prepare strongly for VMC Recruitment 2018.Here we provided you Complete details about Selection Process and Application Fee. Candidates for VMC Female Health Worker Jobs 2018 is selected on the basis of either Interview or Written Test. For Further details applicants must check official Notification of Vadodara Municipal Corporation Vacancy 2018. Applicants may download VMC Notification 2018 from Links provided here. Candidates must prepare strongly for interview. Here we provided you easy steps which help you to fill up Application Form for VMC Recruitment 2018. For details of Application Fee Candidates should refer to VMC Recruitment 2018 Notification at Official Website. Applicants may also download Vadodara Municipal Corporation Jobs 2018 Pdf From Links Provided here. Interested and eligible candidates may apply through online mode. Before apply all applicants advised they must have valid mobile no., email id. Applicants also have scan copy of require documents for VMC Health Worker vacancy. In below section, you can follow some instruction to apply for Vadodara Municipal Corporation Recruitment. First of all visit to official site vmc.gov.in. Download Vadodara Municipal Corporation Health Worker Job Notification. Read all given information carefully before apply. Then after go to VMC Jobs 2018 Apply Online link. Click on the link and then enter all require information. Fill your VMRC Female Health Worker Vacancy Application Form carefully. Submit it and then take hard copy for future uses. You can direct apply online for VMRC Health Worker Recruitment through below link. Conclusion : Vadodara Municipal Corporation has issued notification for recruitment of 258 Female Health Worker & Other vacancies. VMC Recruitment 2018 online form already available on official site. Applicants can fill the online form of Vadodara Municipal Corporation Vacancy before on 10.04.2018. VMC Recruitment 2016 :- Vadodara Municipal Corporation (VMC) has issued a notification for the recruitment for 98 Apprentices Post. Interested candidates can apply on or before 31th August 2016. Candidates can log on to the website of Vadodara Municipal Corporation at www.vmc.gov.in. 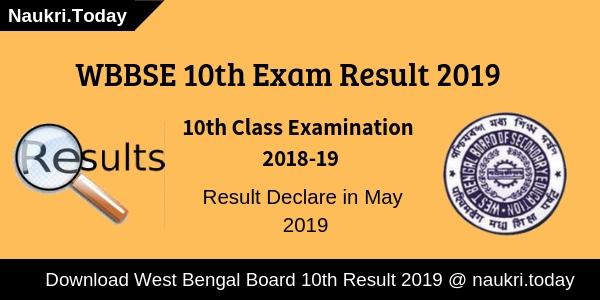 for rest details. Applicants may apply online through the official site. VMC Recruitment is holding the recruitment notification for 98 Apprentice vacancies in their department. For more details applicants can download the official notification through the below mentioned link. To get more detail information for VMC Recruitment 2016 regarding Education Qualification, Age limit, Selection Process etc. is all given below. Name of the Category : Vadodara Municipal Corporation (VMC). Total Number of Post : 98 Posts. Educational Qualification For VMC Vacancy : Eligible candidate who are applying for Vadodara Municipal Corporation Recruitment should have 10th passed with ITI Certificate from a Recognized Board or University. For more information check VMC Apprentices notification. Age Limit For Vadodara Jobs : Applicants minimum age limit should be 14 years. Age relaxation to the reserved category candidates will be applicable as per govt. rules. Application Charges : Have to visit the official notification for the knowledge about the application fee. Pay Scale for VMC Apprentices : Applicant who get selection in Vadodara Municipal Corporation Recruitment will be paid Rs.4518 /- for 1st year, Rs. 5278/- for 2nd Year and Rs. 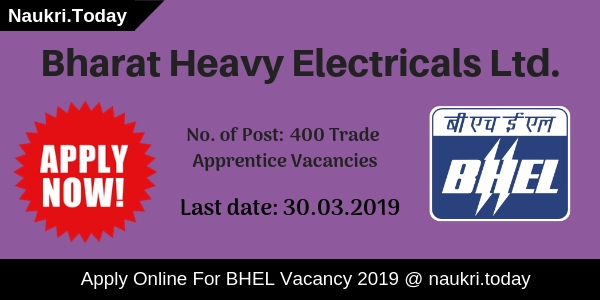 5937/- for 3rd Year for Apprentices Post . Selection Process For Municipal Corporation in Gujarat : Candidates will be selected based on performance in written examination followed by interview conducted by Vadodara Municipal Corporation (VMC). Candidates who are going to apply the application form through online mode on or before the last date 31st August 2016. Candidates should go to the official website www.vmc.gov.in. Then read all the information with carefully which is mentioned on the site. Candidates should click on apply online to get registration ID & password. Fill the application form through online mode without any error. Upload the recent passport size photo and signature on it. Candidates should pay the application fee through online mode. Recheck all the information before click on submit button. Detail information should be correct and genuine. Take a printout of the application form for future use. Note down the important things like ID & Password which is important. Closing Date of Online Application Form is 31.08.2016. VMC Recruitment 2016 for the post of 98 Field workers and Public Health Workers Post. Eligible and Interested candidate can fill the online application form before the last date 31st August 2016.